for their many years of dedication to the performing arts. including the Riverdale Rising Stars scholarship program. 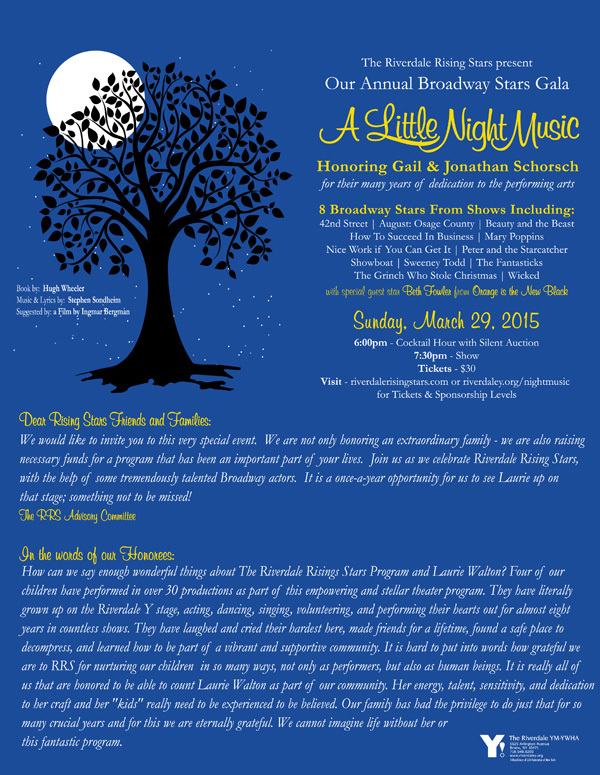 Broadway luminaries and Riverdale’s most talented performers will join forces for a Gala concert production of the Stephen Sondheim/Hugh Wheeler musical A LITTLE NIGHT MUSIC. The one-night only event will feature an onstage 21-piece orchestra, and will be performed at the Riverdale YM-YWHA on Sunday, March 29, 2015 at 7:30pm. The honorees for this event are Gail and Jonathan Schorsch, longtime supporters of the Riverdale YM-YWHA for their many years of dedication to the performing arts. 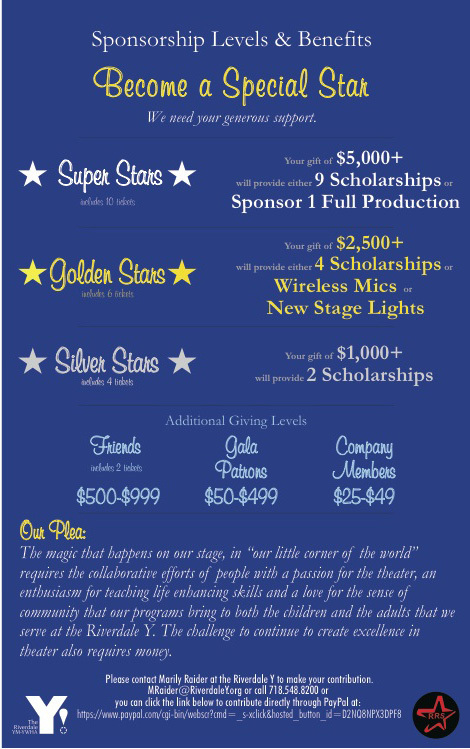 This one-night only Gala event will benefit programs at the Riverdale Y, including the Riverdale Rising Stars scholarship fund, which will enable children and teens to participate in the organization’s theatrical productions. A LITTLE NIGHT MUSIC will be performed at the Riverdale YM-YWHA, located at 5625 Arlington Avenue (just off of Riverdale Avenue and West 256th Street), in Riverdale, Bronx, NY. Tax-deductible tickets begin at $30 for general admission tickets; higher giving levels also include benefits like VIP seats, program ads, and admission to the pre-show reception. General admission tickets and benefactors packages may be purchased by visiting www.riverdaley.org/nightmusic. Come spend a weekend in the country! Set in 1900 Sweden, the critically-acclaimed A LITTLE NIGHT MUSIC waltzes and whirls around actress Desirée Armfeldt and the men who love her. Based on Ingmar Bergman’s comedy of manners, Smiles of a Summer Night, A LITTLE NIGHT MUSIC is a romantic musical full of hilariously witty and heartbreakingly moving moments of adoration, regret and rekindled desire. This one-night-only concert event stars Beth Fowler (“Orange is the New Black,” Tony nominee for The Boy from Oz and the 1989 revival of Sweeney Todd, and a member of the original cast of the 1973 Broadway production of A LITTLE NIGHT MUSIC) as Madame Armfeldt. Joining her are Riverdale Rising Stars Director of Performing Arts Laurie Walton (the Broadway revival of Show Boat), alongside New York City theatre veterans Jenni Barber (The Nance, Wicked)Jamey Hood (The Shaggs: Philosophy of the World), Justin Keyes (How to Succeed, Mary Poppins), Joey Sorge (Nice Work If You Can Get It, How to Succeed), Emily Walton (Peter and the Starcatcher, August: Osage County), and Edward Watts (Scandalous). The cast is rounded out by current and past Riverdale Rising Stars and Riverdale Repertory Company members including Lily Bayrock, Hayden Briklin, Philip Feldman, Nava Schorsch, Mason Taub, and Alex Walton. This concert production will be directed by Bob Walton (performer in The Drowsy Chaperone and 42nd Street on Broadway), and the onstage 21-piece orchestra will be conducted by music director Justin Fischer.